Setting totally new standards for the Central American country of Panama, Jacobo Vahnish won both the Junior Boys’ Singles and Cadet Boys’ Singles titles at the 2017 El Salvador Junior and Cadet Open, as matters came to a conclusion on late afternoon of Sunday 20th August. The 14 year old was very much the star but also there was one other name to note; Puerto Rico’s 13 year old Angel Naranjo; he more than made his presence felt. Quite simply, Jacobo Vahnish proved a step ahead of the field; he was never in serious danger of defeat. Occupying the no.3 seeded position in the Junior Boys’ Singles event, in the later stages he accounted for Puerto Rico’s Jabdiel Torres (11-5, 11-6, 11-9, 11-4) and India’s Mudit Dani, the no.2 seed (11-6, 11-1, 3-11, 11-9, 11-9), prior to securing the title at the final expense of Sweden’s Oskar Danielsson, the top seed (11-5, 11-9, 11-9, 11-6). In the opposite half of the draw, at the quarter-final stage Oskar Danielsson had beaten Daniel Hernandez (11-5, 6-11, 11-4, 11-5, 11-3); prior to ending the adventures of Angel Naranjo (4-11, 11-7, 11-8, 11-3, 11-8). Like Angel Naranjo, Daniel Hernandez is from Puerto Rico. 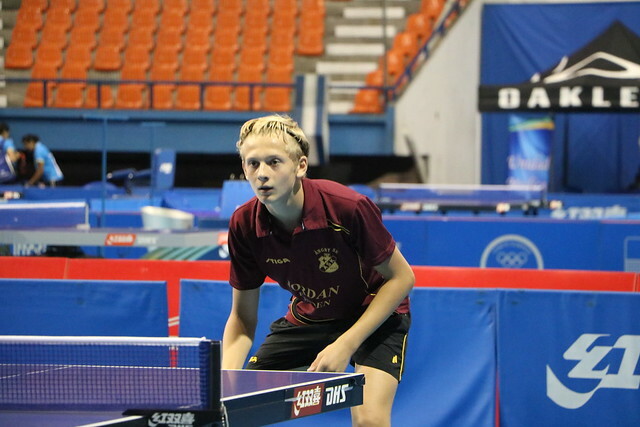 Three players from the Caribbean island, all in the cadet age group and through to the last eight of an ITTF World Junior Circuit Boys’ Singles event was a most creditable performance. Defeat for Oskar Danielsson but earlier in the day there had been success; partnering colleague Oskar Hedlund, the duo won the Junior Boys’ Doubles title. At the final hurdle they beat the combination of Costa Rica’s Gerson Carballo and India’s Mudit Dani (11-5, 11-6, 11-8). Success for Sweden but there was no stopping the young man from Panama. Just as the Junior Boys’ Singles title was secured in style, so was the Cadet Boys’ Singles top prize; an event in which he withstood the challenge of Puerto Rico. At the semi-final stage he beat Daniel Hernandez (11-4, 11-5, 11-7), before overcoming Angel Naranjo (11-9, 11-8, 12-10) to reserve the top step of the medal podium. Notably in the counterpart semi-final, Angel Naranjo had ended the progress of Gustavo Cruz (11-8, 11-7, 11-8), also from Puerto Rico. Bronze and silver for Angel Naranjo but as matters advanced, for the busiest player on the final day, there were two gold medals. Partnering Jabdiel Torres, the player with whom earlier in the week he had won the Cadet Boys’ Team event, he clinched the Cadet Boys’ Doubles title having earlier in the day clinched the Hopes Boys’ Singles top prize. In an all Puerto Rican Cadet Boys’ Doubles final, the duo overcame colleagues Gustavo Cruz and Daniel Hernandez (10-12, 11-9, 11-7, 11-4) to secure the top prize. Meanwhile, in the Hopes Boys’ Singles event Angel Naranjo ended Swedish hopes. At the semi-final stage he beat Kevin Brunzell (11-3, 11-6, 11-5), before overcoming Love Iwarsson to seal the title (11-6, 11-3, 11-7); in the counterpart semi-final Love Iwarsson had overcome colleague Tom Holmqvist (11-7, 11-3, 11-7). Proceedings concluded in El Salvador, attention now turns to Europe. The next stop on the 2017 ITTF World Junior Circuit is the Croatia Junior and Cadet Open. Play commences in Varazdin on Wednesday 13th September.